Smithy85 wrote: Crane is coming down. How would it impact other projects? Given the advanced nature of this one, you'd like to think every option would be explored to get it up and running again i.e developer finds some more money, or a sale and new developer. Of course that could only happen if the numbers stack up. The problem with this, is the process is guaranteed to be painfully slow and then there's every possibility it will come to the end of the sunset date...... which then people are entitled to get their deposits back. I'm sure it would be difficult to convince them to hang on in hope. Both those projects are by reputable developers with a proven track record. Datong has always had a chequered history on this site. The site has been completely striped now. The only BE infrastructure left is the supports for the prefab walls on the northern site. Even the subfloor supports for level one have been removed. Pretty convincing that they've completely walked away, this could be a ghost house for a while. Fairly likely that whoever buys out the site will end up having to demolish the core box already been built. Back to square one. Well, do you really expect any new buyer to have to commission architects who've got to work with the structural layout of the previous design? The answer is no. It's too complicated. Easier to have blank template, demolish and start again. Not rubbish at all, it has happened previously. Aside from Shuz comment about the Architects being locked in, there's also the QA issue of the new builder taking ownership of another's work. If they've pretty much walked away from it, what's the rules with the pedestrian walkway? How soon will it need to be removed? Is there still no comment from Datong? How long can that sustain? Surely buyers are demanding answers. Walked past this morning and there was a colourbond fence up at the front of the site. Reckon the footpath will be back open again fairly soon. I also assume the archaeology find and subsequent dig was unforeseen? These delays slowed things down I think over a year.I am wondering if it wasn’t for that event whether the building would have now been completed and if that contributed to the outcome? Who would have paid for the delays? The developer, right? And the actual dig/cataloguing/storage & consultants fees? Could it have been a condition made on the developer and/or development by the heritage dept etc when it was found? SIX WEEKS after the chairman of a troubled Adelaide developer flew to China – allegedly leaving millions of dollars in debt in his wake – his number two has followed suit. Ping Huang, general manager at Datong Australia, boarded a flight to Kunming in China’s southern Yunnan province yesterday to effectively leave the developer behind the faltering 257-apartment U2 block on Waymouth St rudderless. 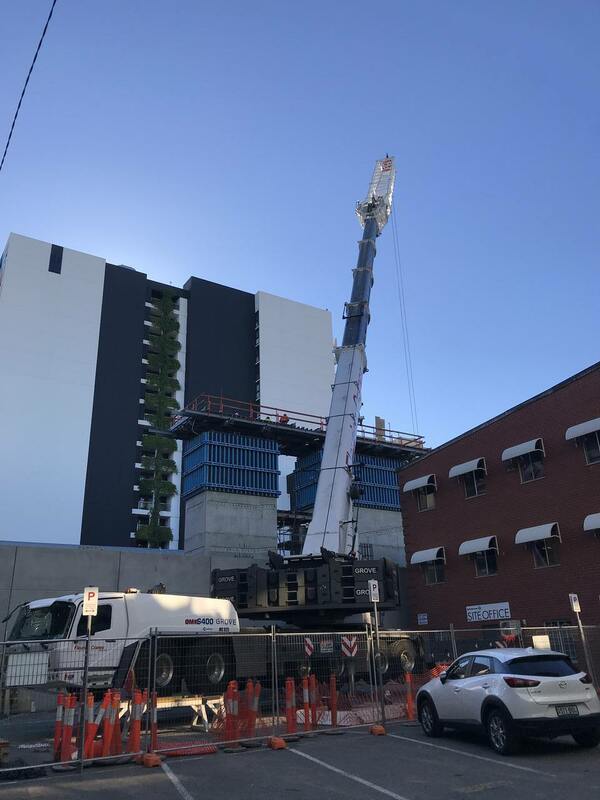 Construction outfit Built Environs terminated its contract with Datong last week over unpaid bills understood to amount to $3.5 million and has now moved off the Waymouth site. Mr Huang is set to return on Monday, January 15, and will face a barrage of uncertainty set to test Adelaide’s booming apartment market. However chairman Jin Liang is adamant his company’s cash flow challenges can be overcome. “Chinese banks are delaying and even blocking some foreign exchange transactions under a decision by the central government to limit capital leaving the country,” he said in a statement. Daryl Young, managing director at Built Environs, confirmed he was happy to re-engage should Datong resolve its financial difficulties. Mr Liang offered his “personal apologies” to U2 buyers. “I am doing everything I can to rectify the situation so that construction may resume. Buyers can rest assured that their deposits are held in different sales agencies and lawyer trusts which are administered by independent third parties.,” he said. Meanwhile, Mr Liang confirmed Datong had entered into a financial borrowing arrangement with high-interest chargers CEG Direct Securities and La Trobe Financial in relation to apartments it owns at Aria on Gouger St. “We would welcome the sale of these apartments as it would aid our ability to service our debts,” he said. Buyers who purchased apartments at Aria have had the title deeds transferred into their names “except for a few who have made special business arrangements with the company at the time of purchase,” he said. Datong, which built Aria in 2015, is yet to lease its commercial ground floor space there. Equally Datong has not assisted non-Australian residents looking to buy an apartment here with securing s457 or other visas, he said. CFMEU secretary Aaron Cartledge said the union was concerned over the financial impact on Built Environs and its subcontractors. The CFMEU claims the collapse of builder Tagara was in part due to funds owed by Datong. Building began at U2 in March with completion of the 27-storey tower due in 2019.